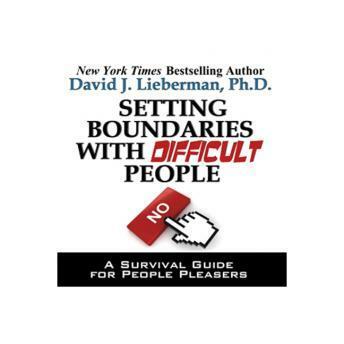 The New York Times Bestselling author, Dr. David J. Lieberman, introduces a wonderful right-to-the-point mini audio book that tells listeners how to put an end to boundary issues once and for all! A work colleague with whom you have only a casual relationship asks you to co-sign a loan for him . . . your neighbor asks you to keep her antisocial, flea-riddled cat for the weekend - again. We've all faced sticky situations like these - unreasonable demands on our time and inappropriate requests from family, friends, co-workers or casual acquaintances. We want to say No. We have the right to say No - always. And yet we don't. Some people will take No for an answer and that's the end of it. But some people don't. What do you do when the person on the other end of your No flat out refuses to accept your No? You'll discover exactly what to say as well as learn the underlying psychology that motivates them to always ask, and you to always give in! Plus, you'll learn step-by-step what you can do about it.